The clock is ticking. The men's basketball tournament at the 2016 Rio de Janeiro Games tips off on 6 August. The nine coaches of teams already in the Olympic field have been able to analyze their group opponents since Friday, when the draw for the event was held at the House of Basketball (FIBA's headquarters) in Mies, Switzerland. For the fans, anything is possible. They can start to let their imagination run wild. Australia's unease about a possible meeting with Quarter-Final nemesis USA in the first knockout game at a third straight Olympics? Relax. That won't happen. Both teams are in Group A with China, Venezuela and two of the three FIBA Olympic Qualifying Tournament (OQT) winners. Two-time defending champions USA will be prohibitive favorites in their pool and the tournament. But danger always lurks at every turn in international basketball. In Group B is a tantalizing mix of heavyweights. Argentina, Brazil, Lithuania, Nigeria, Spain and the other OQT winner will trade blows, looking for a top-four finish and if possible a top-three in order to avoid a likely clash with the USA in the first knockout game. The Americans are not certain Group A winners, yet no one will be betting against them. There are 31 finalists for the 12-man USA squad. Head coach Mike Krzyzewski and USA Basketball supremo Jerry Colangelo have the unenviable task of naming their final squad. One certainty would appear to be Stephen Curry, a two-time world champion with the USA and reigning NBA MVP. Will Olympic gold medal-winning veterans in 2008 and 2012 that missed the 2014 FIBA Basketball World Cup, players like LeBron James and Chris Paul, return for Rio? Remembering how the team played at Spain 2014, one could imagine that the 10 players from that side that have been made finalists will be in the Olympic squad. Can anyone beat the USA? Talent-rich Australia may give them a tough game in Group A. Should France win the FIBA Olympic Qualifying Tournament (OQT) in Manila and Serbia prevail in the Belgrade one, both sides would enjoy the challenge of facing the Americans if they landed in the group. The crossover could be tricky for the USA, too. Imagine the atmosphere in the Carioca Arena 1 should the hosts face the USA in the Quarter-Finals. Brazil almost beat the USA in the Preliminary Round at the 2010 FIBA Basketball World Cup. Spain, Argentina or Lithuania would pose a threat to the USA in the last eight. How can it be that a Boomers program with such a long history in international basketball has yet to reach the podium of a major event? That may change this year. Head coach Andrej Lemanis will have a terrific, experienced backcourt with Pat Mills and Matthew Dellavedova, a powerful frontline with Andrew Bogut and Aron Baynes and solid wings in Joe Ingles and Ryan Broekhoff.
.@balapat: "I think #Rio2016 is going to be one of the best shots that we have had in a long time and maybe ever, and we want to make the most of it. That should be very exciting." 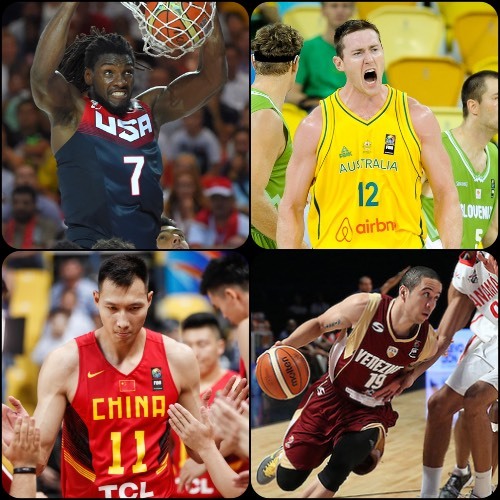 Australia will have a deep, talented roster at the Rio Games. Remember how good they were at last year's FIBA Oceania Championship when Ingles and Baynes did not play? It seems Lemanis's squad will be good enough to finish second in Group A and should at least finish end up in the top four for the third consecutive Olympics. But it's not out of the question they could finish fifth, depending on their result against Venezuela. One thing is for sure. If they were to advance, the Boomers would run through a brick wall in a bid to reach the last four. A young, tenacious, physical China under veteran coach Gong Luming won the 2015 FIBA Asia Championship title. They will need to have the same spirit and be fully healthy to have any success in Rio. China were terrific with their home crowd behind them last year. The best player of all was their three-time Olympian, Yi Jianlian.
.@Yi_JL: "There were many young players that had not experienced this sort of test and they faced a lot of pressure but we fought for every ball with a tenacious defense to win the championship. At the #FIBAAsia2015, the team was younger, so to win the championship and earn straight qualification for #Rio2016 makes me proud and is moving. I have to thank my teammates, the fans and my family." That event is no comparison to the level of competition they will face this time. Every game will be like a do-or-die clash for the Chinese. The clash with Venezuela is one that the Far East side will already be identifying as a must-win game for them to have a shot at reaching the Quarter-Finals. Anyone that has seen Venezuela head coach Nestor 'Che' Garcia in action will know that he can match wits with anyone and do a good job of making adjustments during games. Add his nous to an emotionally-charged up squad that is hellbent on proving last year's FIBA Americas Championship win was no fluke and the Vinotinto should be dangerous. They will try to recreate the magic of their Semi-Final triumph over Canada which punched their ticket to Rio. The USA are likely to be too tall of an order for Venezuela but none of the other sides, including any of the OQT winners, will be striking fear into Garcia's men.